In DraftSight 2015 a new tab/command is added QUICKMODIFY . This command is collection of 4 modify commands Copy, Move, Rotate, Scale to access them with Single command . When you run this command and select Entities Press Enter then Command line ask for Base point this is first reference point you need to Specify to have other options available. You can change base point later from Options or Right Click options. Copy: Select Copy option and Copy selected Entities to other location . 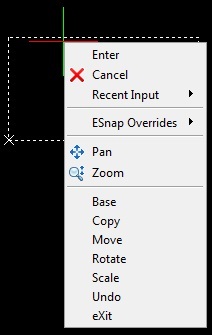 You can Change base point from here or Undo any Changes or Exit from this Command option. Move: Select Move option and Specify destination to Move selected Entities. Rotate: Select Rotate option and Specify rotation angle or Click inside GA at Specified angle to rotate selected Entities with base point. Scale: Select Scale option and Specify Scale factor by entering numeric distance or Select scale point in GA to Scale selected Entities. You can do Undo or Exit if Quick Modify command is running and when you are out of above command options .